Temple Sinai is very proud to take part in the 32nd Annual Victorian Streetwalk on Thursday, November 29, 2018. This event will take place in downtown Saratoga Springs from 6-10pm, (note that Broadway will be closed from 5-10pm from Route 50 to the Spring Street intersection). 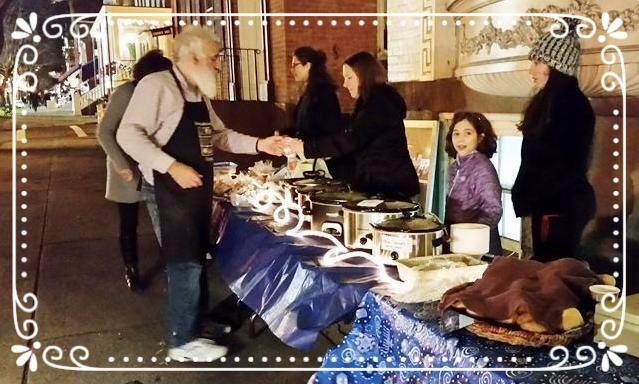 Stop by the Temple for homemade vegetarian soups and delicious baked goods prepared for by members and friends of Temple Sinai. Get warmed inside with hot Cider and Cocoa, and even take a tour of our historic building. The Temple Parlor Gift Shop will be open and has lots of wonderful Chanukah gifts for giving (candles, gelt, menorahs, and beautiful jewelry)! Victorian Streetwalk specials include 15% off all jewelry, and 10% off menorahs and select items during the event. Chanukah is less than a week away!